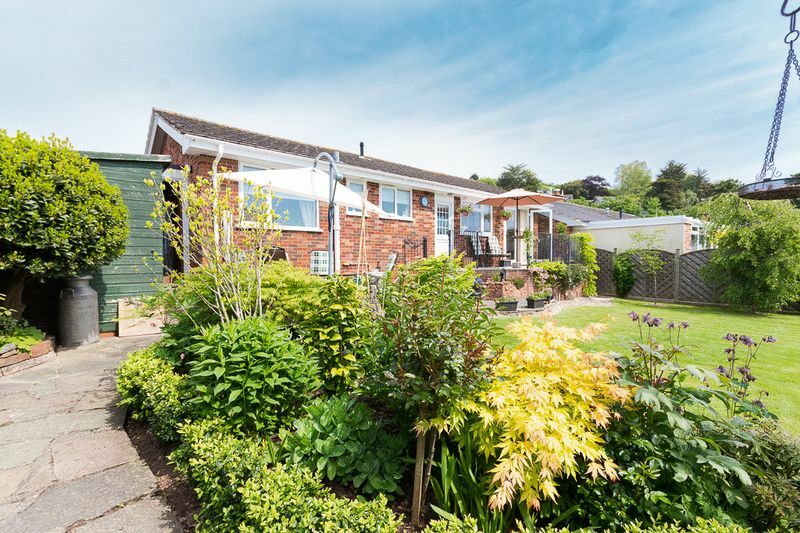 A stunning example of a fully renovated two double bedroom large bungalow situated in the elevated village of Bishopsteignton surrounded by beautifully maintained gardens that are a true credit to the current owners! 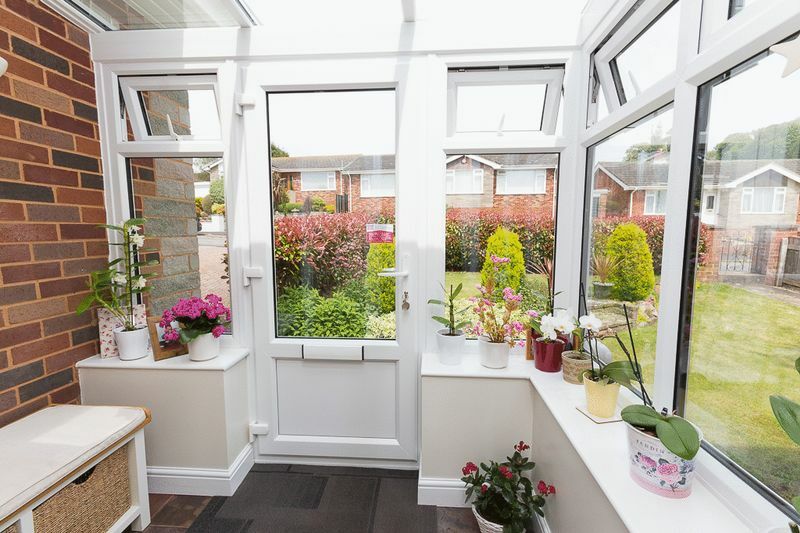 Fully double glazed with gas central heating and blinds included throughout where fitted to make it that bit easier when moving in! Viewing is highly recommended to appreciate all this property has to offer. 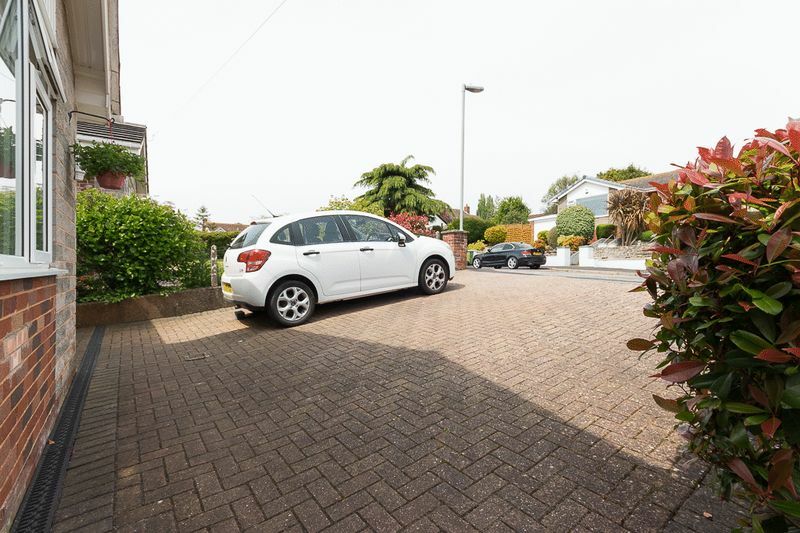 Well-positioned in a cul-de-sac location within Bishopsteignton. 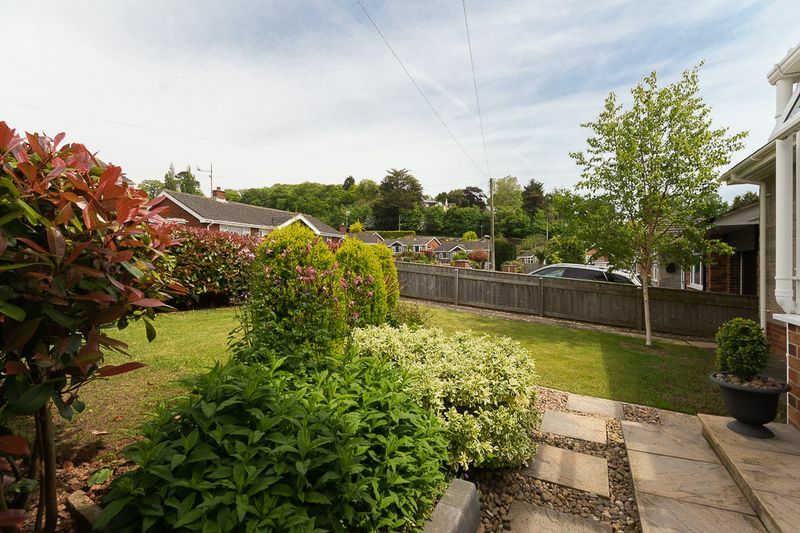 Bishopsteignton is a sought after village on a good bus route set between Newton Abbot and Teignmouth, close to the picturesque Teign Estuary. The village offers many local amenities including a Post Office with shop, a well regarded primary school, a garden centre, several churches, a village hall, pharmacy, several public houses, a local real ale brewery, the Old Walls vineyard and the Cockhaven Manor Hotel. 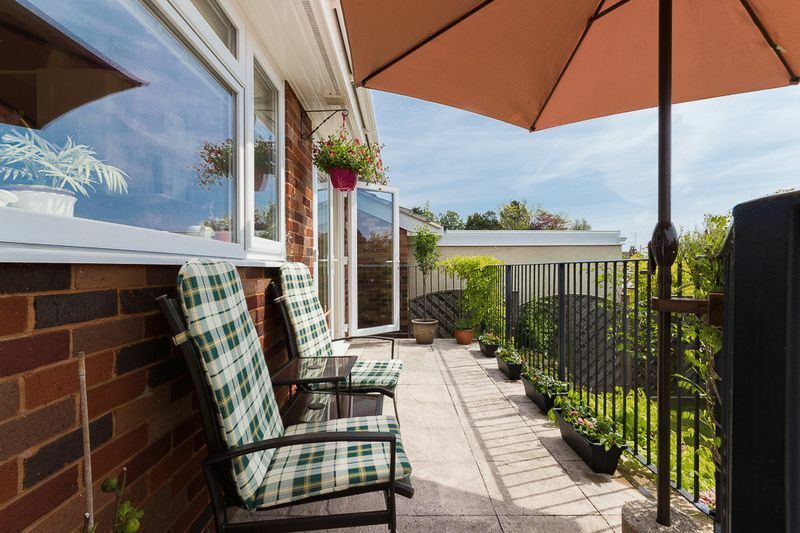 The area is great for commuters with good access to the A380 dual carriageway serving Torbay, Exeter and the M5. Mainline rail services are available in both Newton Abbot and Teignmouth. There is a small beach on the estuary, known locally as Down Steps, The River Beach or Red Rock. It is reached via a footpath from the village that crosses the main Teignmouth to Newton Abbot road and the railway, and goes down the steep Luxton Steps. This ancient footpath leads to the point where villagers could ford the river at low tide to reach Coombe Cellars. The seaside town of Teignmouth is approximately 2 miles away, best known for it's promenade and beautiful sandy beach! There are a wide range of larger shops and amenities to include a Morrisons and Waitrose store, a secondary school, doctors, dentists, and many cafes and restaurants etc. 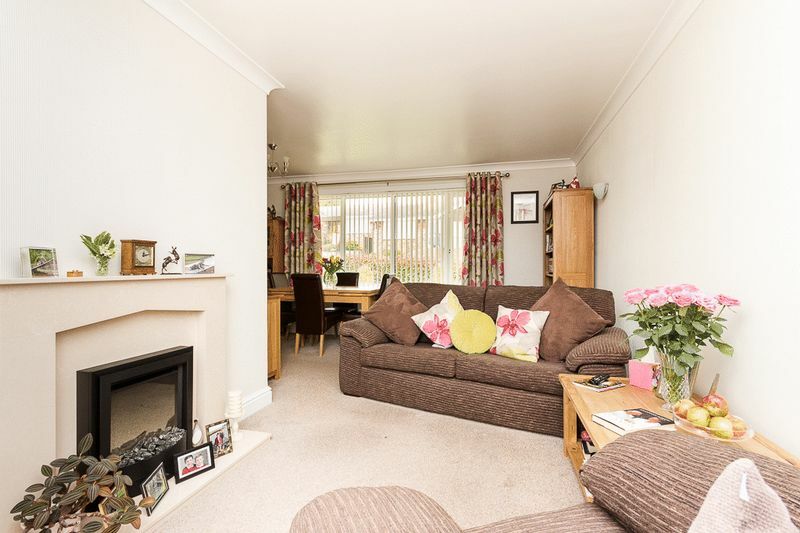 You enter the property into a recently added porch with dwarf walls and double-glazed windows to two sides, which look into the front garden creating for a pleasant approach to the property. This has been well fitted with multi coloured slate tiled flooring. There is a window sill which is great for displaying plants and photos! 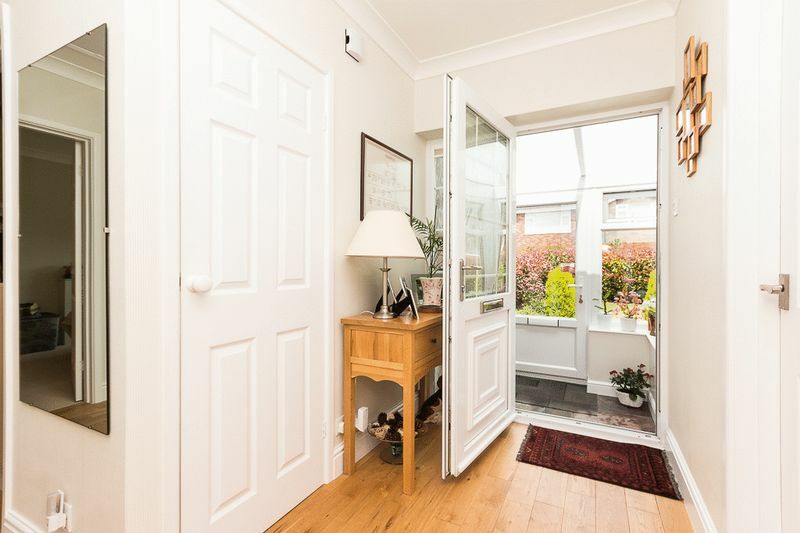 There is a further door into the entrance hallway which is oversized, allowing for ample room to greet guests and a pleasant walkway through the property with access to all rooms and has been fitted with oak flooring. 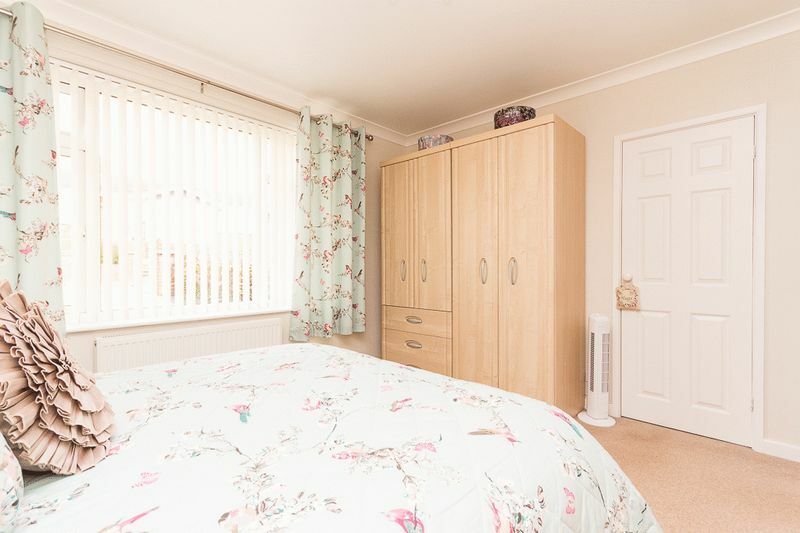 There is an airing cupboard with shelving, access to the partly boarded loft with pull down ladder and storage cupboard perfect for hanging coats. 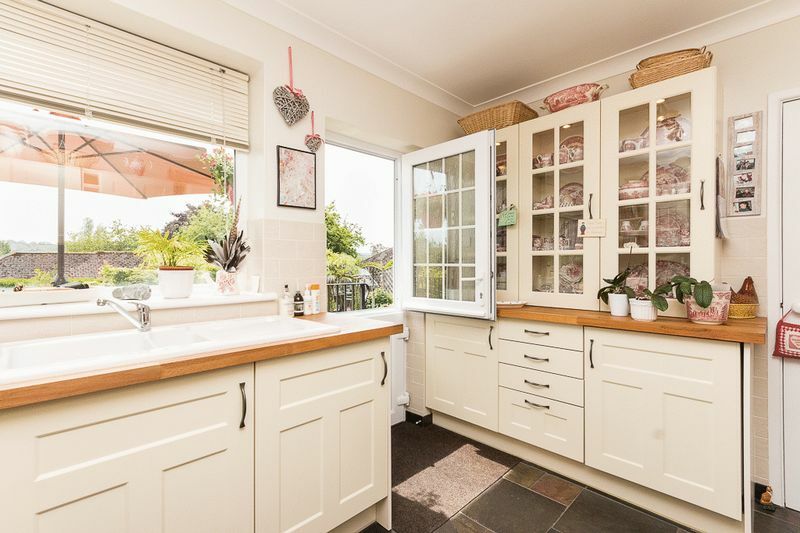 The kitchen is well positioned to the rear of the property with a large window allowing for a marvellous outlook onto the garden and beyond, enjoying far reaching views of the surrounding country towards the estuary! 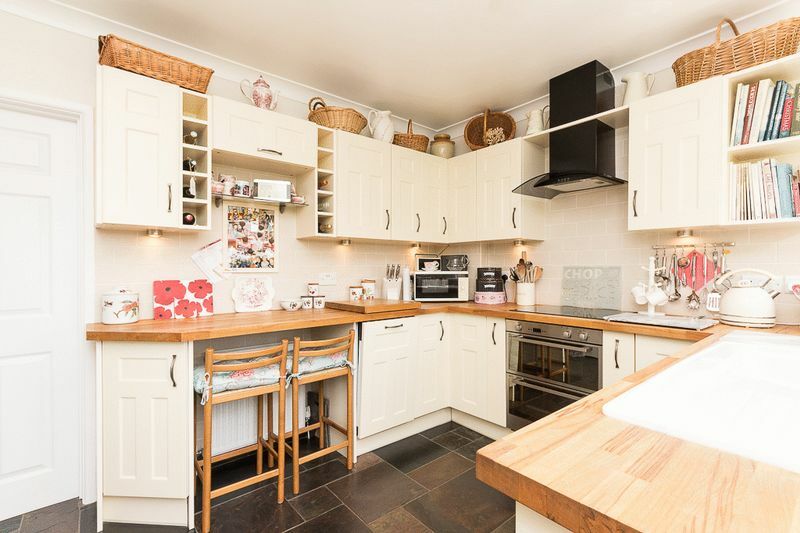 The kitchen has been fitted with a range of soft close wall and base units with built in bottle holders accompanied by solid beech work surfaces over incorporating a ceramic one and a half bowl sink with drainer and an induction hob with tiled splashbacks. The work surfaces and dresser unit are illuminated by under counter lighting. There is an integrated washing machine, slimline dishwasher, under counter fridge and double oven. 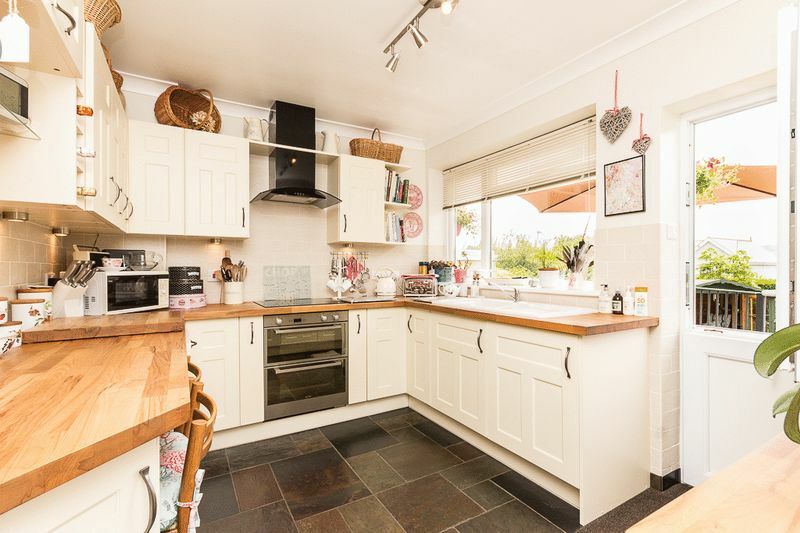 A breakfast bar also features along with a slate tiled floor which compliments the English Rose kitchen beautifully! A double glazed stable door is a welcome addition which opens onto the balcony. There is a pantry off the kitchen which houses the boiler and has been fitted with shelves for further storage. 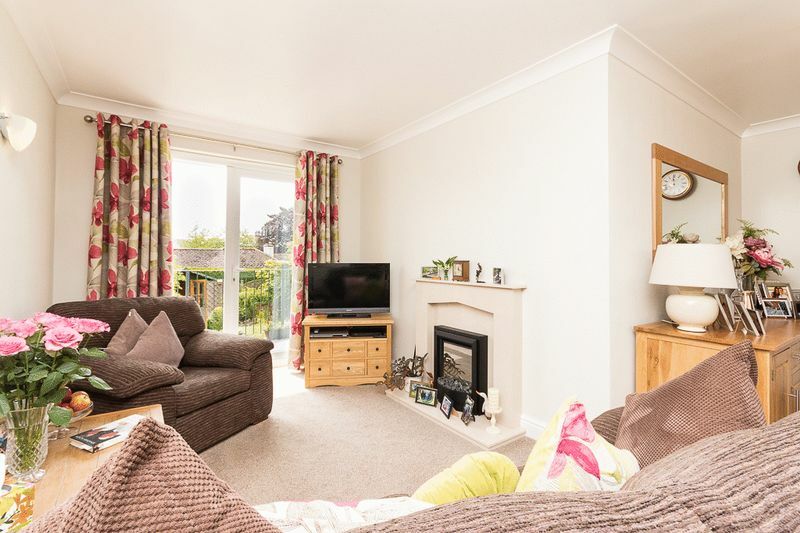 The living/dining room is an L-shaped room with a dual aspect with window to the front garden and French doors to the rear providing a fantastic outlook and access onto the balcony which is a delightful spot for a table and chairs and also leads to the garden and kitchen. The living room also features an electric remote controlled fire with a stone surround which is great for those cosy winter evenings! 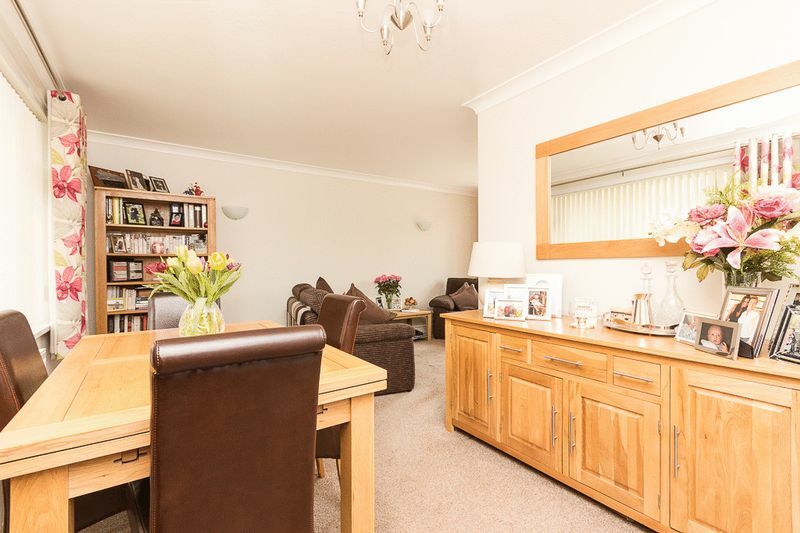 The dining area has ample room for a table and chairs along with further furniture. 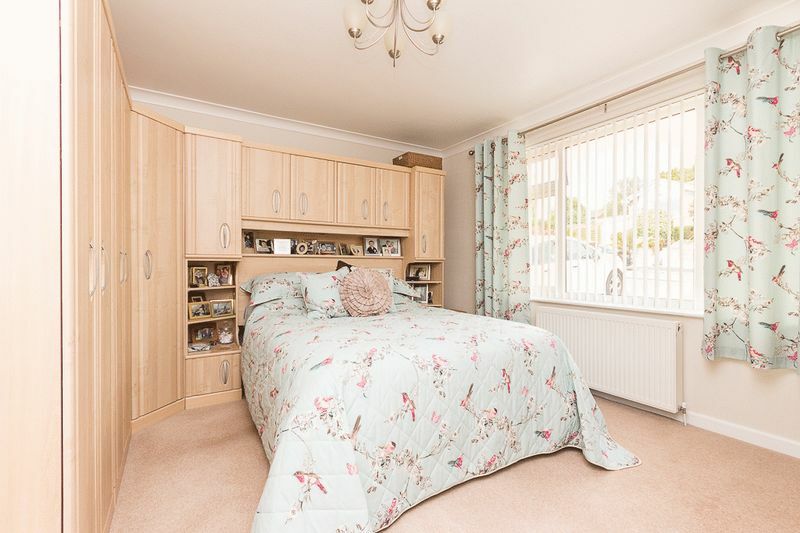 Bedroom one is a great size double room with ample storage space having semi-fitted bedroom furniture comprising of 5 double size wardrobes and drawers. There is a further recessed storage cupboard which is great as a shoe cupboard! 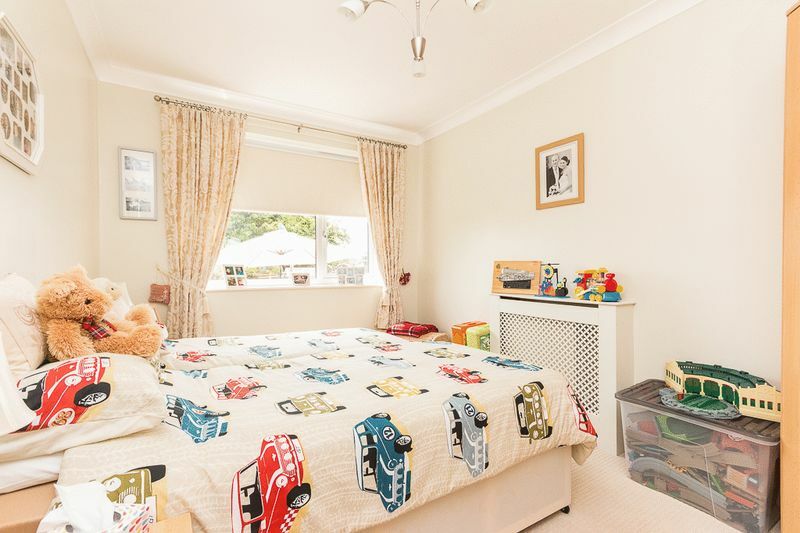 Bedroom two is another spacious double room located to the rear of the property with a window allowing in a wealth of natural light along with far reaching views to trees and fields, watch the view change through the various seasons and the variety of colours that accompany. There is a close away office cupboard which is a great space saver and keeps everything looking neat and tidy with the appearance of a corner wardrobe when the doors are closed! 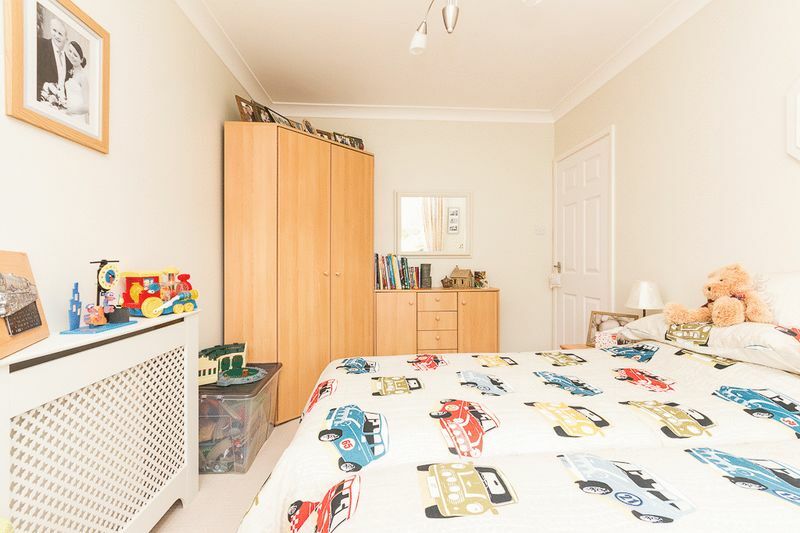 There are also drawers and cupboards along side. 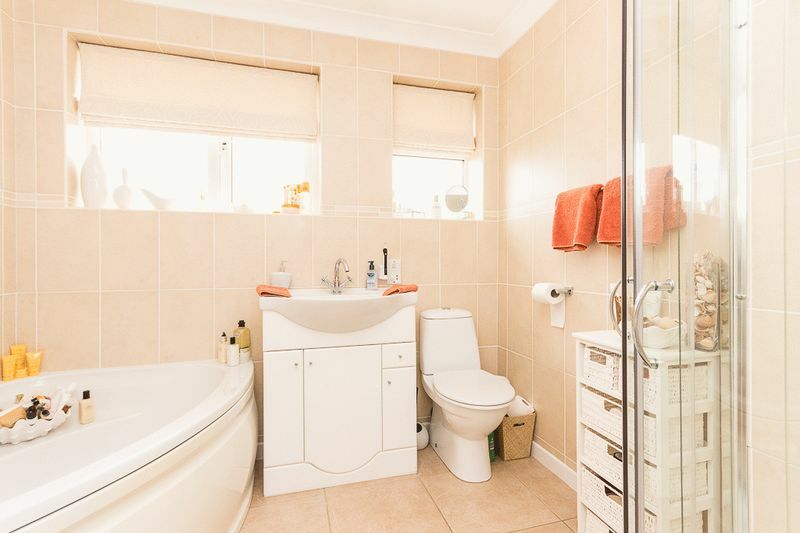 Completing the internal accommodation is the bathroom which is modern and has been fitted with a four-piece suite comprising corner bath, separate shower cubicle with shower, wash hand basin within vanity unit, WC, floor to ceiling tiles with tiled floor, extractor fan, towel radiator and two glazed windows both fitted with Roman blinds. 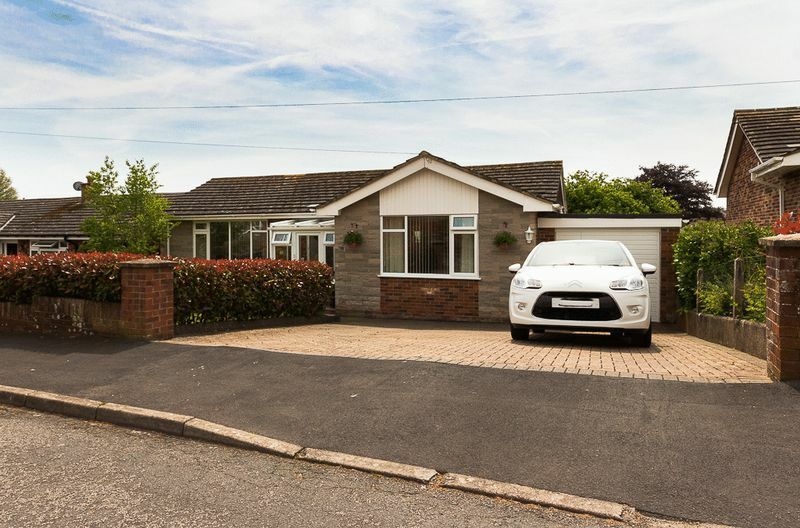 The bungalow enjoys both front and rear gardens and a garage with a large brick paved driveway offering parking for several vehicles. 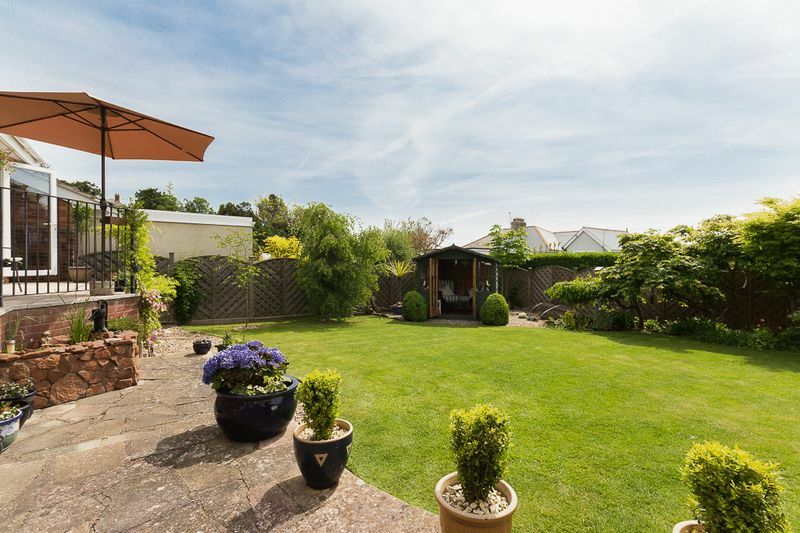 The rear garden has a high degree of privacy and has been beautifully landscaped to enjoy a fine manicured lawn with mature acer trees and various seating areas dotted around the garden. 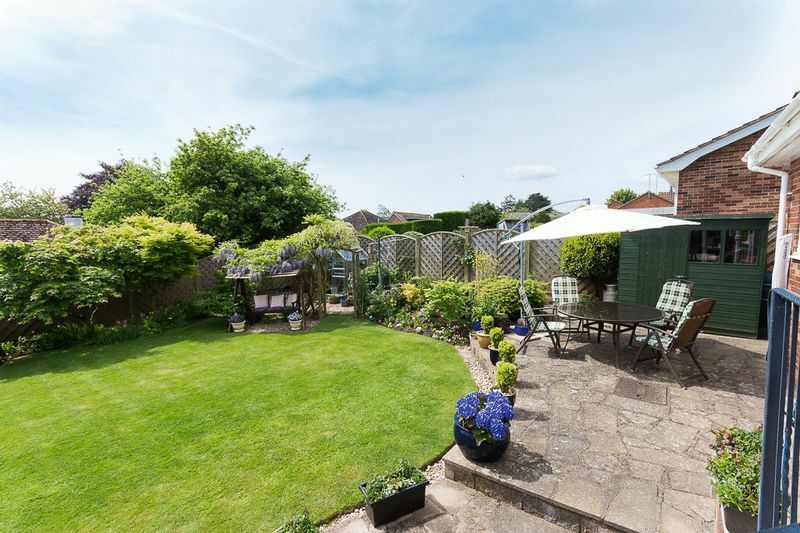 The main patio offers a splendid view over the garden making it a great spot for a table, chairs and chiminea for alfresco dining on a warm evening and perhaps the odd BBQ! 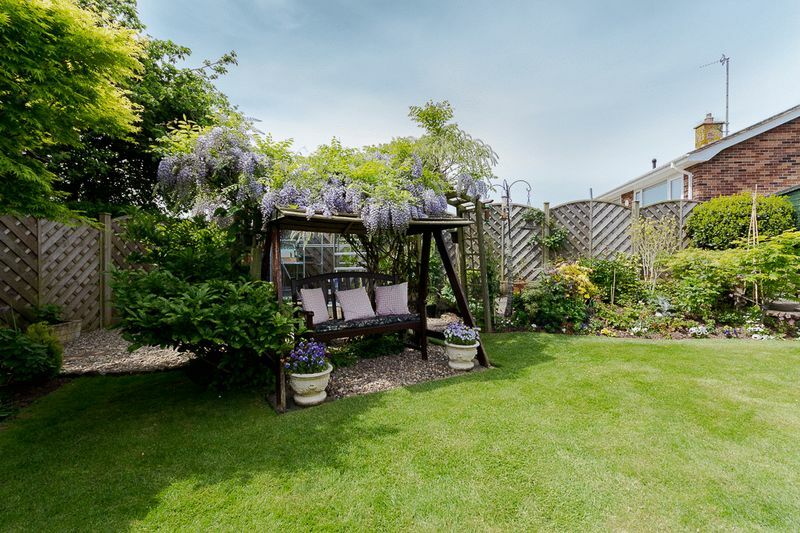 There is an established wisteria trailing over the perfect canopied spot for a garden bench! To the side an archway leads through to a further gravelled area in the garden which houses the greenhouse. There is a summerhouse also in the garden with power, a wonderful place to sit and read a newspaper in the shade or enjoy a quiet cuppa! Behind the summer house is a fish pond. 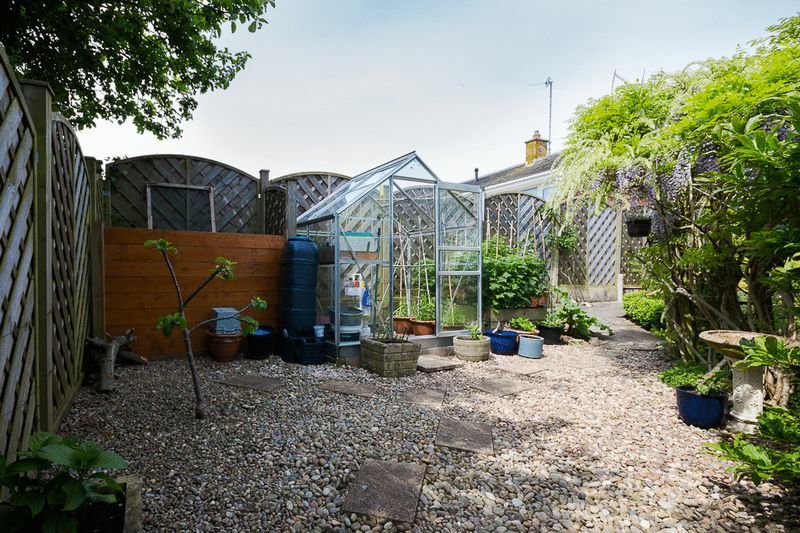 The garden is well enclosed with fencing providing the boundaries, making it safe for both pets and children. 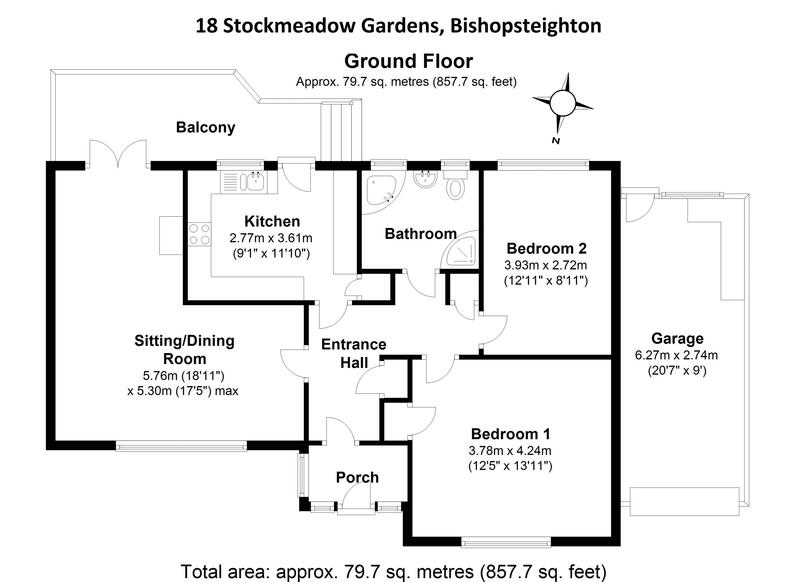 There is an outside tap, shed, external storage area beneath the balcony and side access.